A lot has been made of clutter these days, and Lord knows most of us could get rid of a lot of junk. There is a perverse nature to basements which accumulate things as though they were living organisms independent from the house or the family living in them. Piles of old dishware, bicycle parts, and old clothes grow exponentially and spontaneously like the vines which find fissures in the casement windows and wind their way around the boxes of college books and camping gear on the dusty shelves below. We all have felt trapped by our basements and our overstuffed closets. It isn’t so much that we are materialistic and have simply bought too many unnecessary goods; but just the opposite. We are parsimonious at heart. There is simply something sinful about throwing out a ‘perfectly good’ jumper which travels from bedroom closet to Empire chest, to guest room armoire, to the basement. I knew a man who had been brought up on a ranch in the West during the Depression – a double whammy for clutter. As a boy he had been taught never to throw anything out. 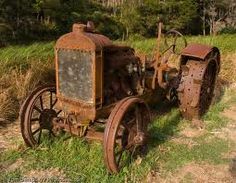 Nuts, bolts, gears, wire, engine parts, and old axles might come in handy some day when little was bought new and most things were cannibalized and cobbled together. The specter of the Depression only made frugality more important. Perhaps because of this austere upbringing, he became a success. The ranchland virtues of hard work, discipline, routine, and parsimony stood him in good stead, and he built and sold many businesses until he was quite well off. He never forgot his upbringing, however, and his basement was no different than the old barn. His workroom – another legacy from his early DIY Depression days – was so cluttered with old saws, bits, flywheels, struts, flanges, and starter motors that he had only a few square feet of space available on his workbench His upstairs office was no different. He was simply unable to throw anything out and was convinced that articles on bonds, precious metals, or used cars would eventually be useful. Stories of old women who die in apartments so chock full of old newspapers, magazines, clothes, and mementoes that the fire department has to axe their way through the front door are familiar. They, too, have never been guilty of materialism; but an overweening sense of frugality and old fashioned Puritan values. There are those families who indeed buy too much, especially for their children. Playrooms are littered with plastic toys and gadgets that are played with once and then kicked into a corner where they pile up until transferred to the basement. Closets are jammed with pairs of shoes bought on a whim, dresses that have been worn to one occasion, and sports jackets that looked good on the floor but nasty at home. The result in all cases is clutter. Yet I know few people who obsess about it. I know that my creepy basement is there growing on its own; but as long as I close the cellar door tightly and eventually attack the mess, I will be all right. Every so often I will open an upstairs closet – a way station to the basement – and cannot get past the wall of wool, cotton, paper, and old binders that have been forced in for years. That impenetrable, impossibly jammed and frightening bulwark of unneeded junk makes me frustrated, angry, and impatient. Within days it has been emptied, cleaned, and ready for more. Some friends have said that my office is cluttered; but it is perhaps the most organized and orderly room in the house. While I do have many photographs, post cards, vases of dried flowers, books, pottery, sculpture, and silver cups on my desk and tables; and while the walls are hung with Gujarati mirror work, Kenyan jewelry, and reproductions of Manet and Sargent, the office is not cluttered. In fact ‘things’ help me concentrate. They are a pastiche of the past; a temporary and welcome distraction. In a bare room my mind would not be anchored or centered. Many people find that their concentration actually improves in a bustling public place like a café or bar. There is a still-unexplained synergy between the basal commotion of Starbucks and the the tunnel vision of the worker. My office collage is the visual equivalent. The most important issue regarding clutter is often overlooked. It is not so much the accumulation of things that bleeds into mental space and clutters the mind. It is the choice of acquisitions that is the problem. There is a scene from the remake of the movie The Fly in which Geena Davis asks Jeff Goldblum why he never changes his clothes. Surprised, he says that of course he does and opens his closet in which are hanging three identical suits, shirts, and ties. “I change my clothes every day”, he says. He like Einstein and many other people have understood that the key to mental clarity and acuity is reducing choice. The more necessary but ultimately unimportant actions of the day that can be routinized and reflexive, the more time there is for serious reflection. A close friend of mine always buys the same car – a Camry. The car has improved over the years - more airbags, better road handling and suspension, more power and gas mileage; but its design is the same. The devices for turn signals, radio, heater, lights, flashers, and rear window defroster are in the same place they were ten years ago. The car is safe, reliable, and comfortable. He does not have to clutter his mind with decisions about what car to buy; and he is at home in the car from the moment he sits down in the driver’s seat. When he told his daughter that he was buying a new car (he had always bought used models), she was flabbergasted when he told her a Camry. “With all the incredible choices out there”, she said, “you’re buying another Camry?”. She didn’t get it; and few people, especially in America do. A number of years ago French women had one good outfit in their closet and little else. It was always well-tailored, elegant, and made of the finest materials. Designed by French couturiers in the classic style, it never went out of vogue. Bella figura may be Italian, but French women have always known that looking good does not mean a different outfit every day It means looking good every day. Especially after the War, French women with their one-dress-but-elegant style could look fashionable amidst the shambles. Although French women reduced their choices because of culture, couture, and post-war economies; and the Jeff Goldblum character and Einstein did so because of the need for intellectual space, Hindus have practiced this austerity for millennia. The world is maya or illusion, they say. External features of the world are illusory and meaningless, so why bother with them? They only clutter up the soul and impede it on its way to nirvana. So the reduction of clutter in and of itself makes no sense. It is the end result that counts. If it makes one reflect on one’s materialism, all well and good. If its austerity makes way for more intellectual and spiritual evolution, even better. And if it forces the confused mind into an austere but focused routine, best of all.